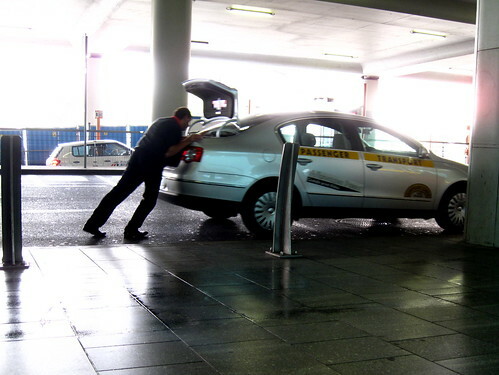 Imagine my surprise at Prague Airport when, while waiting outside to be picked up, I saw a taxi driver in the line of taxis pushing his car forward to the front of the line. Imagine my further surprise when all the taxi drivers in the long line followed suit. How completely bizarre and how completely cool. I wonder if there are similar laws in Czech Republic as in Denmark about having to turn off your engine if you're motionless for for than two minutes. Whatever the case, it was brilliant to see all these men pushing their big, fancy, late model Volkswagons. I was lecturing about Marketing Bicycle Culture in the city of Pardubice yesterday and am currently in Prague. More on the state of the bicycle union in the two cities later.